The world around us is changing. There are tension and violence almost on every corner of the world. 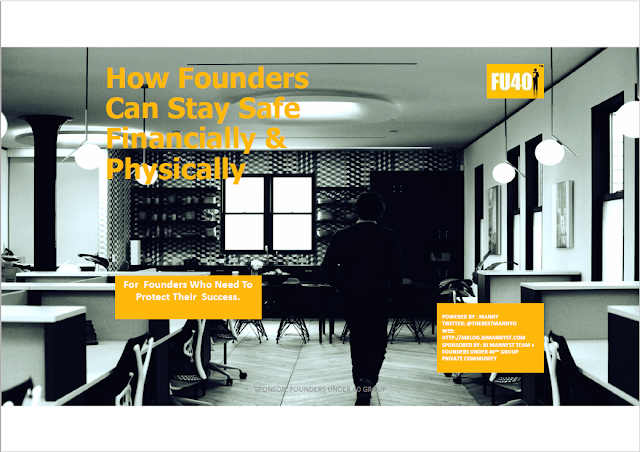 As a founder(s) your responsibility are to constantly assess the risks around you from online, neighborhood, community, regionally, nationally, and globally because your ability to stay alive depends on it. And from personal experience and observation it is never to easy to fully cope with change. I’m not sure what tomorrow will bring but I do know some education is better than none. 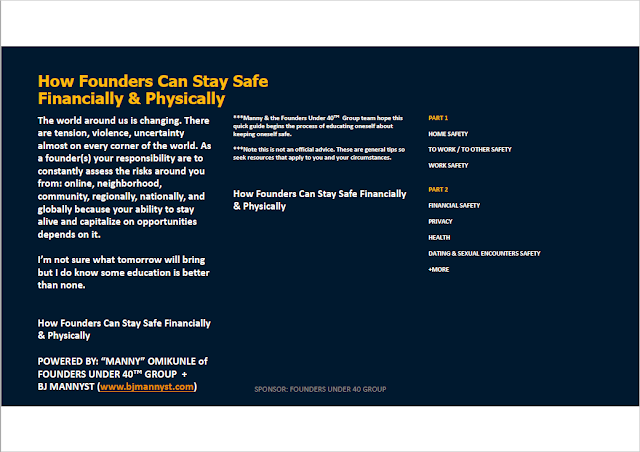 ***Manny & the Founders Under 40 Group team hope this quick guide begins the process of educating oneself about keeping oneself safe. Note this is not an official advice. These are general tips so seek resources that apply to you and your circumstances. Founder(s) the threats to your well being could be in your home, outside your home, your journey from home to work, your journey from work to recreation / home, who you engage with, whose online, etc. So why not improve your safety iQ. Everything about your founder life begins at a point. A point where you plan your day, prep for it, etc and that usually means some kind of home of some form. Anyway stopping to think about it, I just realized that with all the recent natural disaster in the world a lot of people have lost their homes. Our prayers go out to you and for those who can help, please give to your local Red Cross. Determining what assets (I wouldn’t technically call your wife/husband & children assets to their faces) you need to secure. Identifying the threats and risks that could affect those assets or your business assets overall. Identifying what safeguards you should put in place to deal with threats and secure assets. Monitoring your safeguards and assets to prevent or manage security breaches. Dogs are good deterrent to burglars. Even a small, noisy dog can be effective. You can burglar-proof your glass patio doors by setting a pipe or metal bar in the middle bottom track of the door slide. The pipe should be the same length as the track. A pipe or metal bar can be used to burglar-proof a patio door. Garages present special challenges for security. Here are some tips for keeping your garage secure. ***Source: Unknown. Modified for relevance. the sites that could compromise your network. permission when downloading new programs (if on a shared computerand too young to understand the nature of software). verify that they are a safe person to send the information to. for all to see and refer to. symbols so they are harder for cyber criminals to steal. actual destination is a lookalike site at another location such as www.myfakebank.com. made to look almost identical to the original it is copying. Always be suspicious of URLs you don’t recognize. images as you would with text. If you don’t recognize the sender, treat it with caution. Look for misspelled words in the body of the email. This is a trick fraudsters use to bypass spam filters (see the explanation to follow). Requests that you click on a link in the message. [Plus, pickup these helpful FREE insights for any founder(s) looking for inspiration to be more outstanding.